In order to tie our seven trenches into the wider landscape, we go surveying and make a record of any stone features we encounter. A square stone on its own and the floorplan of what looks like a house! A large scale wall and a possible well . All this is also an opportunity to learn more about the vegetation. Above right, the feature which we interpret as a well was shrouded by a thick cover of dhigga (Hibiscus tiliaceus). Screwpine trees (Pandanus tectorus) seem to appreciate archaeological features; they are often comfortably settled over ruined stone structures. Elsewhere on the site… work is clearly coming to an end. On an unrelated note, but something I really had to mention. We have been eating very well. Including screwpine cake..! The day begins with a meeting with the local councillors. The purpose is to explain our aims and we have a lenghty set of discussions on historical mosques, cowries and the medieval maritime trade. Another important aspect of the discussion is to clarify that we are here working on behalf of the Maldives Department of Heritage, and won’t be absconding with gold or ibn Battuta’s bones. The project is underpinned by a Memorandum of Understanding and by the University of East Anglia’s ethics code. The Council are very supportive, keen for us to find something, and will issue a statement to the island’s residents. Then back to survey. The western part of the island is largely occupied by kitchen gardens (watermelons, chillies…) and by forest. Where people have dug to cultivate, sherds litter the surface. 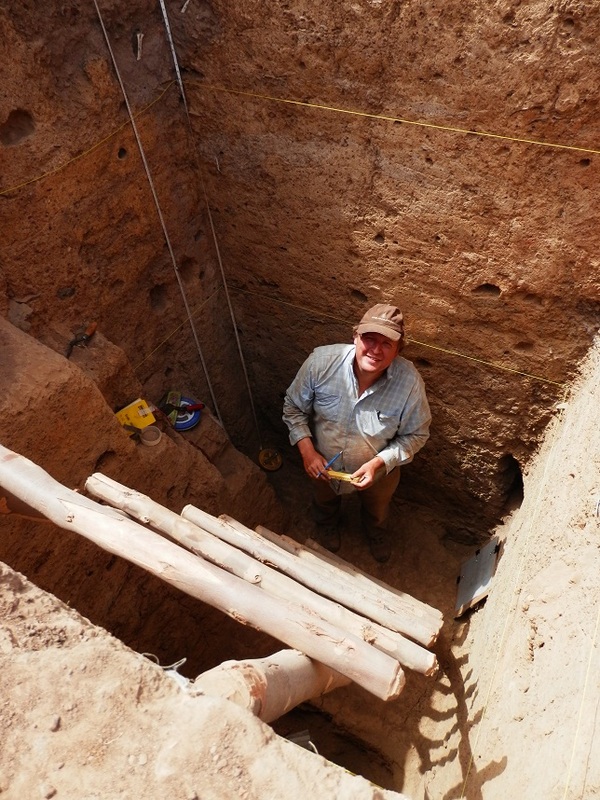 What we are looking for in searching for a place to excavate is an area which has not been disturbed in living memory but also – for practical reasons – is not too densely vegetated. For the next three days, then, we will be searching for this magical combination. 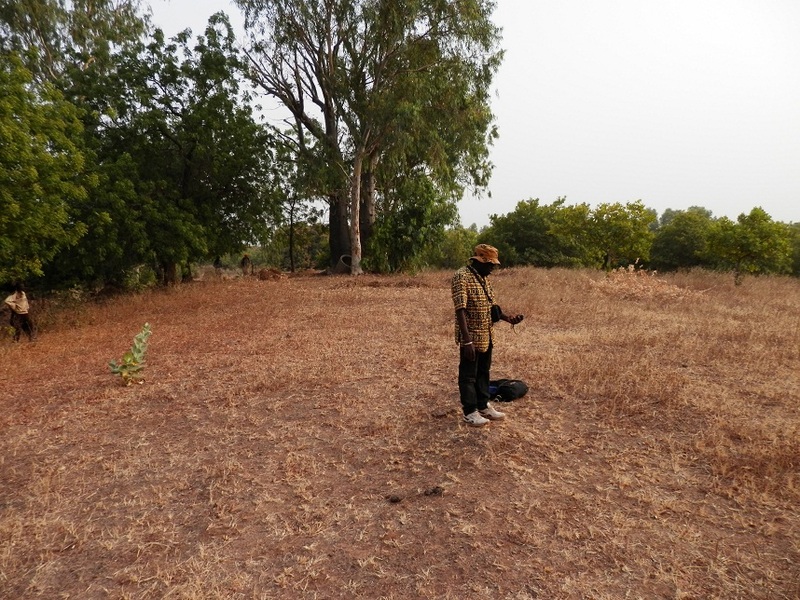 We do this by asking the locals about the use of the land, and by testing the soil at regular intervals (to this effect we spent a while hacking through spiky trees and grass bearing compass and tape measure). The last few days of the 2014 field season. 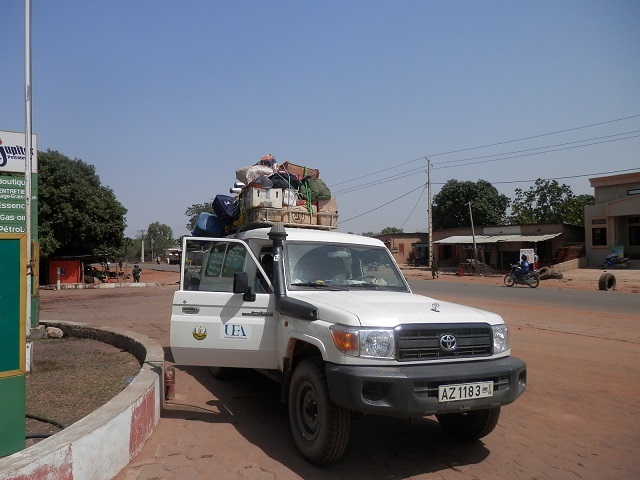 One car is due to leave Guene today to head south to Cotonou, another on Wednesday, a third is heading up to Niamey. For my part I returned to Cotonou late last Thursday with Didier, Sam, Edith, Jennifer, Mardjoua, Agathe, and Valere. Though it did take fifteen hours (! ), it seems a short time considering the gulf that separates Birnin Lafiya and the urban comforts of Cotonou. In Cotonou, the last few days have been spent packing boxes of sherds, in a meeting or two, and backing up all the data – over 11000 digital files and a pile of papers 15cm high, all duplicated and which will be kept in separate locations so nothing gets lost. Up north, five teams were still active. Caroline and her group finally identified a site with iron-working furnaces (these had eluded us this year! ), at Tombouto. 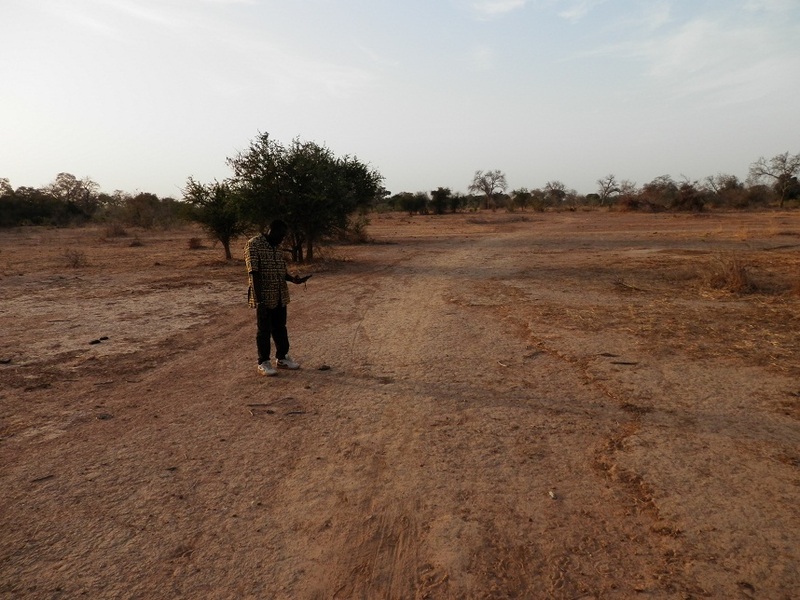 Ali and his cohort completed test pits 26 to 29, ranging east towards Madekali and the Nigerian border. 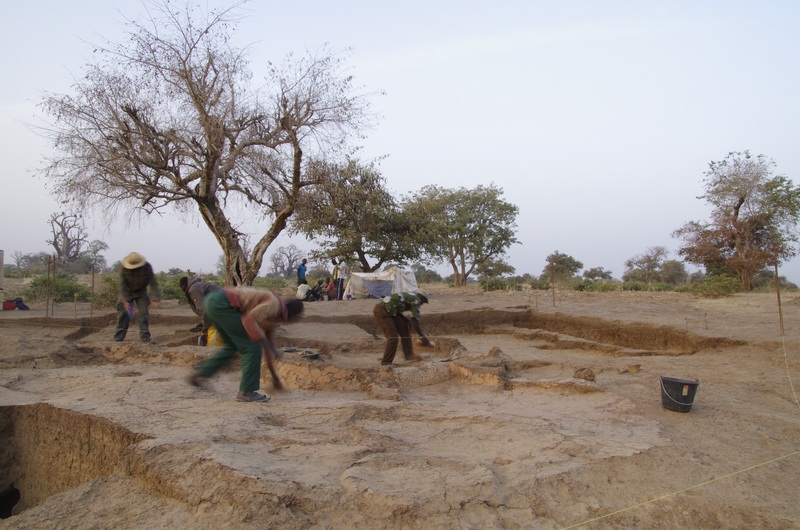 Oumarou and the rest of the Niger group began test pitting at the site of Katanga, which is on the left bank of the river and thus in Niger, and mentioned as an ancestral site by many of our informants. 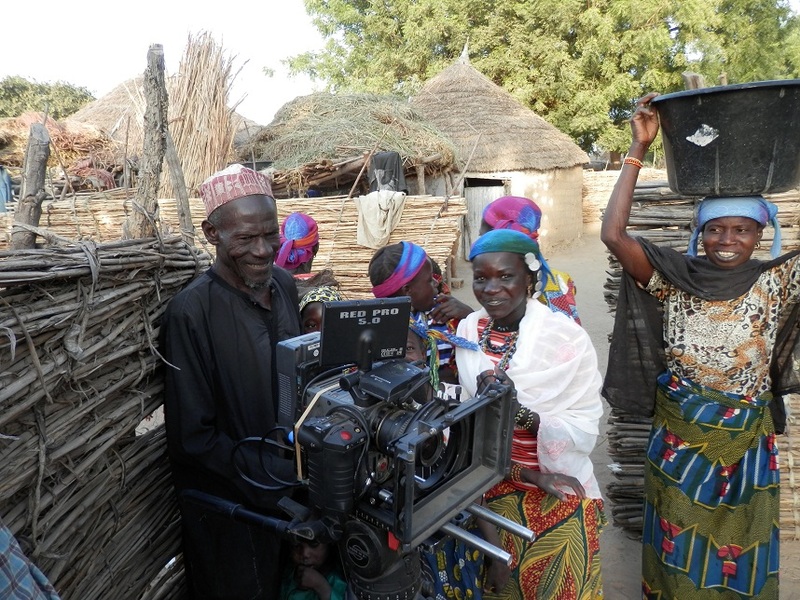 Olivier and the ethnoguys conducted enquiries in Guene then westwards, again towards the Nigerian border. Finally Nadia, based in Malanville and washing pots on the grounds of the grand mosque there, surveyed extensively along the road east. Thus, all of these are giving us invaluable new data points, in particular concerning the easternmost part of our research region, our key target for 2014. Day off for the team, which now numbers 27 people. Test pits are underway at Birnin Lafiya and another of the modern town’s satellites, the house complex is being further unveiled, a series of units across the site are exploring the build-up of the mound, we are emptying two dye pits in the former dyeing centre of Karimama (unearthing some interesting 20th century archaeology), while survey along the Alibori river is aiming to set the site within its wider regional context. Continuing with this regional context, the flying team is about to begin its activities upriver from here, and its mission is to find sites to close the gap we have between AD 1300 and 1800. In hunting for these villages, we’re pursuing a theory that revolves around contour lines. 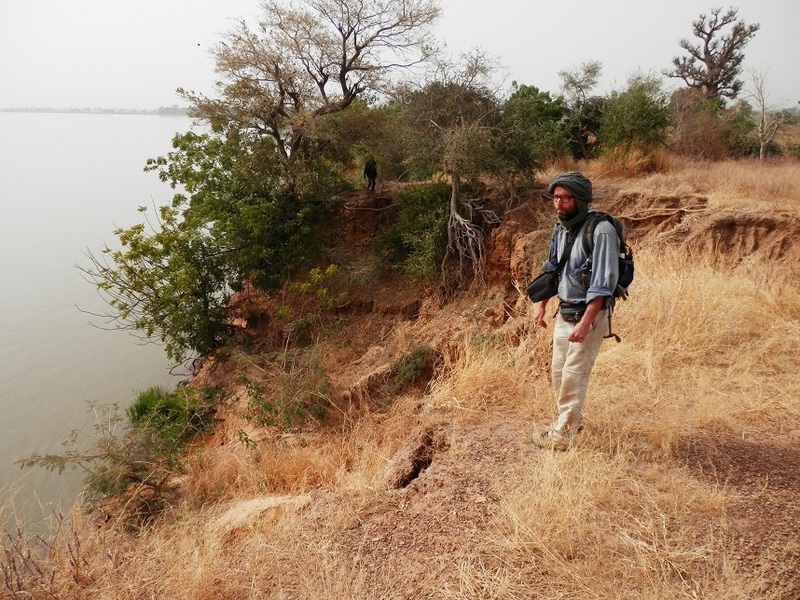 We’ve noted for some time that sites occur on slight elevations so, now finally armed with 1:50,000 maps of the region, we are going to target our test pits based on topography, supposing that the height of the Niger river will have conditioned past settlement at various times. We also have the extensive information collected over the past 4 years by Olivier G and his team, which has identified which modern villages possess satellites which immediately preceded them. This week sees the departure of a number of team members. The archaeometallurgy, survey and geoarchaeology teams have been particularly badly hit! 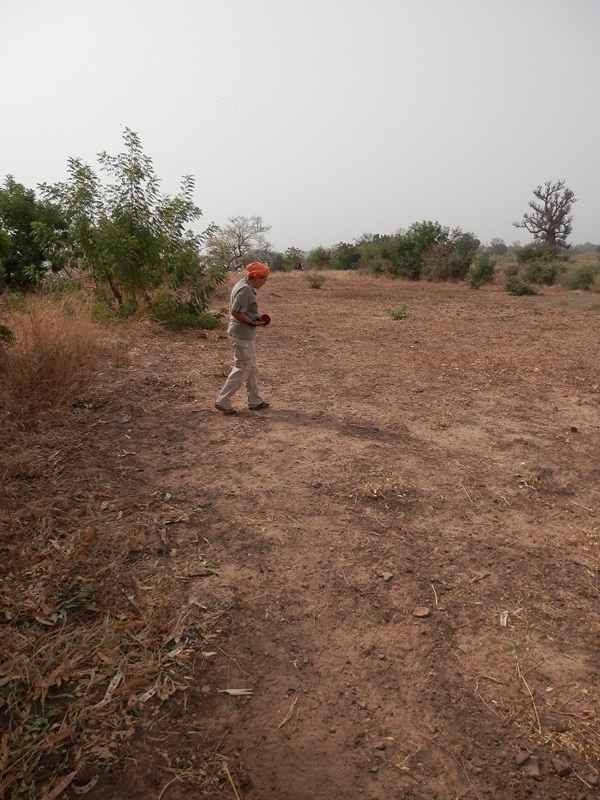 Above are Ali devastated at the rate of erosion of a mound site along the river, Caroline hunting for furnaces, Didier marking a possible site for excavation in 2014, and Paul sampling our deepest trench at BLaf, which was dug by Ali and Nicolas. However fear not, the bulk of the team will be remaining till the 13th, and we are still occupying two bases – Birnin Lafiya and Karimama.